Complete your New Zealand Hiking Adventure. The North Island is home to more than three quarters of our population and is the focal point for Māori culture and history. Its rich stories and legends are woven into a landscape that bubbles with geothermal activity, vastly different from the neighbouring South Island, it’s well worth spending some time here exploring the heart of New Zealand. Plus, you’ll get a chance to tick off a hike on the Tongariro Crossing from your bucket list – if it’s not on there already, it should be! This trip is designed to be the perfect addition to any of our South Island trips. Want to have all the information on your doorstep? Welcome to the North Island and New Zealand’s beating cultural heart. A vibrant and diverse landscape made up of active geothermal areas, dormant volcanoes, pristine beaches, immense forests and subterranean wonders. After meeting your guides and fellow travellers in Auckland, we’ll board a ferry to Waiheke Island in the Hauraki Gulf, just a short boat ride away, but a world apart from the hustle and bustle of our largest city. After a refreshing day relaxing and exploring, we’ll return to Auckland for our first night of the trip. We’ll jump on the local passenger ferry bound for the beautiful Waiheke Island, a firm favourite amongst locals, and a short 45-minute ferry ride from the centre of Auckland. Watch the cityscape melt away behind you and catch glimpses of small offshore islands dotted around the gulf, before Waiheke comes into view. We’ll spend the day on the island exploring the beaches, taking short walks and visiting one of their famous vineyards for sample of the local wine, before returning to Auckland for the night. We leave the big city this morning and make our way down to Rotorua, a rich cultural hub and geothermal wonderland. On the way we’ll stop to stretch our legs with some short walks and awesome photo opportunities. This afternoon we’ll enjoy a fascinating introduction to Māori culture, before being treated to a Māori feast cooked in the traditional way. We’ll spend the night here in Rotorua. Set in a ‘land of lakes’, the bubbling mud pools, spewing geysers and rising steam give Rotorua an otherworldly quality. We’ll check out the famous Pohutu geyser; with consistent eruptions of up to 30 metres (100 feet), it’s the pride and joy of the Te Puia Thermal Valley. According to Māori culture and tradition, geysers like Pohutu are viewed as a gift from the gods. We’ll learn about the local history of the Ngati Wahiao tribe and enjoy a hangi (a traditional Māori feast) together this evening. Tonight, we’ll stay in comfortable accommodation on the shore of Lake Rotorua - it’s a great place for a quick dip at the end of the day! Today you’ll experience some of the best sea kayaking and mountain biking that the aptly named Bay of Plenty has to offer. You might like to hone your existing skills or give something new a try, but either way there are options to suit everyone. We’ll be staying in Taupo for the next two nights and you’ll have time to explore and get settled before dinner. Perched on the edge of New Zealand’s largest lake and with views down towards the central plateau and active volcanoes, Taupo is a great spot to explore on the water. Our first adventure of the day starts on the shores of Lake Taupo, once an old volcanic crater, as we board two-person sea kayaks and get ready to paddle. You're welcome to give your arms a workout if you like or take things at a more relaxed pace as you glide across the crystal-clear waters of the lake. Explore the beautiful cave rock carvings created in the late 70’s by master carvers Matahi Whakataka-Brightwell and Jonathan Randell as a gift to Taupo. Our specialist kayak guides will share some of the history and Māori legends from the area, and even show you their favourite rock jumping spots if anyone fancies a quick swim. This afternoon we swap our paddles for walking boots with a scenic hike to the spectacular Huka Falls, following the meandering banks of the Waikato River. It’s an easy walk and along the way you'll enjoy stunning scenery including natural hot pools, forest and gullies, with the mighty falls awaiting you at the end of the trail. Reckon the Sweet North is the trip for you? Ready to book? Tongariro is New Zealand’s oldest national park and boasts dual World Heritage site status, acknowledged for both its cultural and natural significance. As we make our way across this moonlike landscape dotted with turquoise and emerald lakes, you’ll discover why the Tongariro Crossing is known as New Zealand’s “best day walk”. We’ll make an early start this morning, taking on the 19.4kms of this famous volcanic crossing. Set high on the central plateau amongst three active volcanoes, the scenery is more akin to surrealist art than real life. With red rocks, deep emerald lakes, steam rising from craters, and the unmistakable cone-shaped mountains, it's as if you’ve stepped back in time or possibly onto another planet. It’s a good climb to the top on a well-formed track, and we’ll stop along the way to hear stories about the area from our local guides. Their knowledge of the area and affinity with the land really bring this place to life. We’ve got the whole day to appreciate our environment and enjoy this very special spot. It may be the last day of your Sweet North trip, but it’ll be one to remember as we explore the hidden depths of Waitomo, marvelling at the limestone formations, crystal tapestries and thousands of glowworms that illuminate the cave system. We’ll then make our way back to Auckland where we’ll say our farewells. If you’re heading down to the South Island to join us on another trip, we’ll help with a smooth transition. You’ll get geared up this morning for our last epic adventure together - complete with wetsuit, helmet, headlight and rubber inner tube, you’ll feel like a spelunker par excellence! Dropping down the natural spiral staircase into the famous Ruakuri Cave system, we’ll be treated to views of striking limestone formations as we hear the distant thunder of subterranean waterfalls. One of the highlights is lying back in your inner tube and looking up at a glittering galaxy of glowworms, appearing as if they were the night sky on the ceiling of the cave. There are dry options available if slipping into a wetsuit isn’t your thing. After emerging from underground, we’ll enjoy our last lunch together before hitting the road back to Auckland, allowing plenty of time to happily reminisce about the last five days. New friends and wonderful experiences have had their share in creating a raft of memories to last you all the way home and beyond. We’re happy to drop you at the airport or at your Auckland accommodation. We recommend that you combine this trip with one of our South Island itineraries to enjoy the complete New Zealand experience. The Sweet North trip works particularly well in conjunction with the Short South, if you're short on time, or any of our longer South Island trips if you really want to leave no stone unturned. It's very important to us that you have all your questions answered about our Sweet North trip. We’ve collected some of the questions we get asked most often and answered them below. Or visit our general FAQ page here for more answers! And if you still can’t find the answers you need, give us a call or send us an email and we’ll help you out! How fit do I need to be for the Sweet North? Click here to go to a handy page with a summary of the distances and approximate times for every walk and activity on our Sweet North trip! What is the accommodation like on the Sweet North? We’ve five days in the North Island to showcase the incredible diversity of our other main island and we’ve chosen three great places for you to stay. Click here to find out more about the accommodation on this trip. What time does the Sweet North trip start and finish? Please note, from October 2019 we will be changing our Sweet North joining hotel. Please contact us for further information. **If your travel plans fall outside of these times please check with us before you book. Can’t find an answer to your question? Give us a call or email and Jodi will be happy to help. Click on an album to view that trip’s photo gallery. Click on photos to view them larger. We absolutely loved the Sweet North itinerary, we fully appreciated the incredible attention to detail, the work that went on behind the scenes and the guiding was superb. Coupled with a great group of fellow travellers made it all such good fun. We could never have put together such a fabulous trip on our own! A dream come true! NZ trails made us feel like we spent a year there with all that we saw and experienced, but it was only a few weeks. Hayley has a great way with people, very organized, and handled every detail. Jasmine knew so much about the area, and was great on the trails. The questions we posed about any and all things in New Zealand were not a problem for them! Our guides took great care of us and kept things fun and easy going. 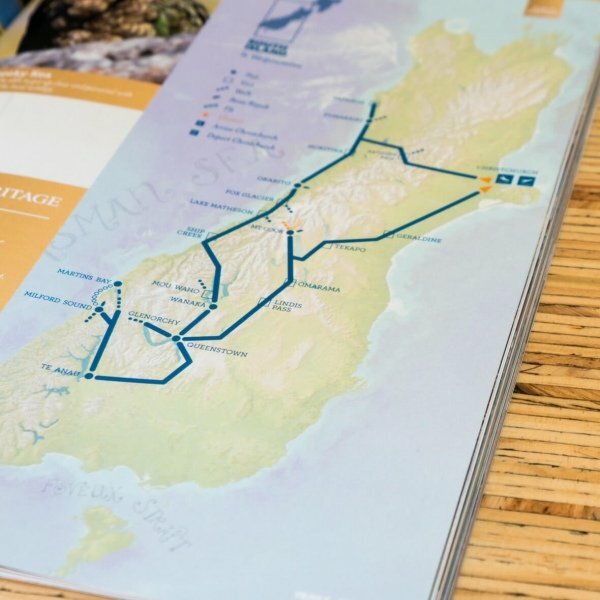 The tour’s activities and adventures combined with travel around the beautiful countryside in a comfortable, clean, safe touring van gave us a really great NZ experience. Accommodation was always clean, quiet and comfortable. Meals were healthy and delicious. We’ve been spoiled! With a rich culture and fascinating history, the North Island is remarkably different from the South but equally impressive. Over 5 incredible days discover the diverse landscape, from golden sand beaches to huge inland lakes, oversleeping volcanoes and otherworldly cave systems. 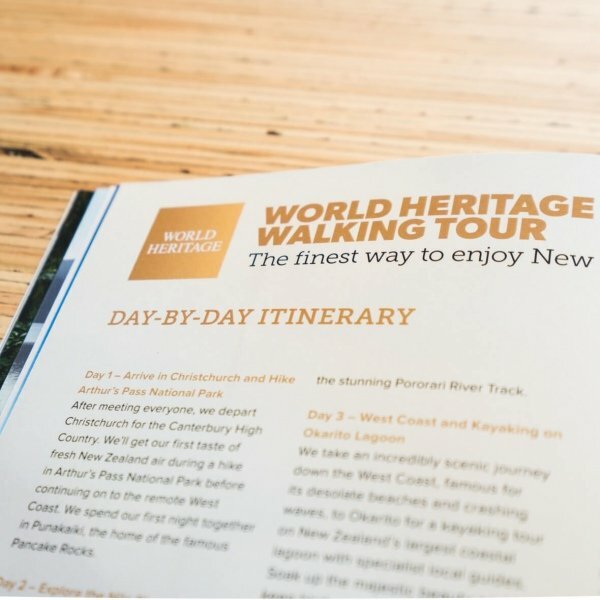 On a journey that epitomises the best of the North Island, you’ll enjoy legendary Kiwi hospitality, delicious meals and very comfortable accommodations. This trip is designed as the perfect addition to any of our South Island trips, although it also stands alone if you’re short on time. Check out trip dates below to find your ideal time frame. Places on our trips fill up quickly so keep an eye on availability here too. If plans change, your deposit is fully refundable up to 90 days before the trip, so secure your spot now. Get your FREE Trails brochure now! What's included in our new 36-page brochure? · Find out all about our 5-14 day, all-inclusive, guided adventure tours of New Zealand. · Detailed itineraries and maps of our five tours (plus our combo tour). · Learn what you can expect from our all-inclusive tours – the accommodation, food, transport and activities. · Find out what makes our trips so special – our people, the places we go and the activities we do. · Get expert advice to help decide which tour is right for you. · Includes stunning images of New Zealand. · Enjoy a glimpse of the hidden gems you’ll uncover and the exclusive access you’ll receive when travelling with New Zealand Trails. - Bonus: get special offers, trip advice and updates to your inbox. Request your copy by filling in the form to the left and we’ll post it out to you anywhere in the world for free. 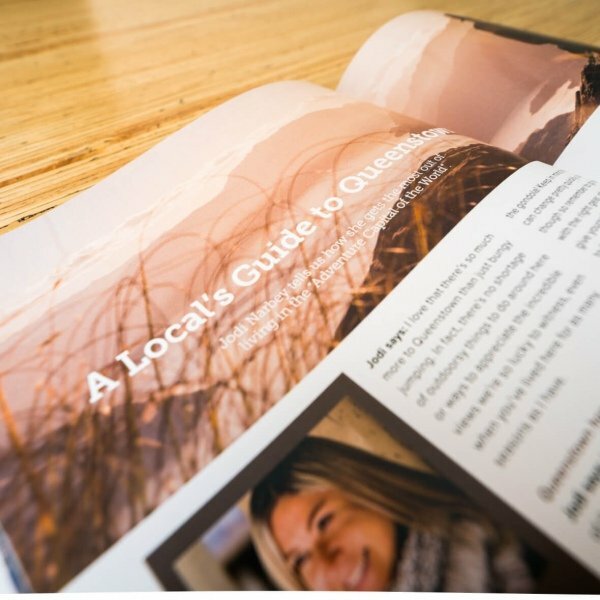 Not only is it an excellent guide to the finest small-group tours in New Zealand, but it will look very smart on your coffee table and you can read it in the bath. 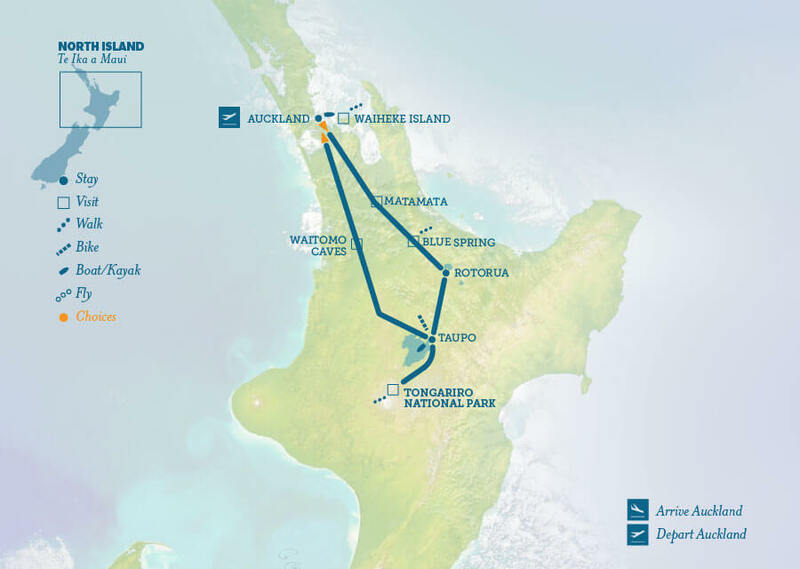 5 Day North Island Tour – Auckland to Auckland. All inclusive. If the price below is not in your home currency, get an indication of what it converts to by using our currency converter below. Or ask us for trip prices in your home currency. Combine this trip with any of our South Island trips to see both islands! We do have shorter trip options and solo travellers don’t pay more, unless you’d like an upgrade to a private room. PLEASE NOTE: This is a sample of our current itinerary. Keep in mind we are constantly fine-tuning and improving our trips based on feedback from our guests and guides, availability, etc. So your trip will be at least this good, but we reserve the right to make slight alterations without notice to make it even better!